I'm home. I'm back at work. People need to shut up. I think the complainer on the plane gave me a cold. The cold is only in my throat, it's weird. I returned the lens (got there at 8:29 for an 8:30 return, took my last photo 2 doors down from the store) and have not purchased one of my own because they were snapped up when I got back and because I am having nightmare-inducing money angst. I took over 450 photos over the wedding weekend and I have only just begun to process them and the experience of taking them. The happy couple purposely didn't hire a photographer because they knew they had a bunch of pro-ams attending and felt they'd like photos by friends better. I took that as the go-ahead to pretend I'd been hired and to basically do a no-pressure wedding shoot. It was fun. There's a reason that photogs wear comfy shoes. Whoops. Anywho, of the shots processed thus far these are the two that sum up the weekend for me. 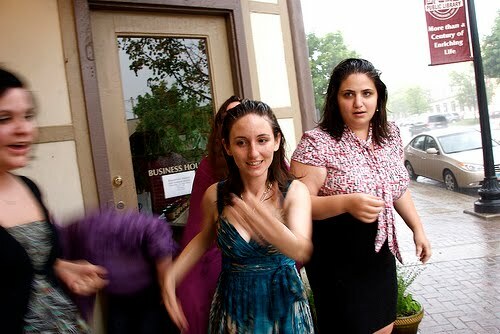 Above, the bride and friends during a perfectly-timed and heartily enjoyed rain shower. 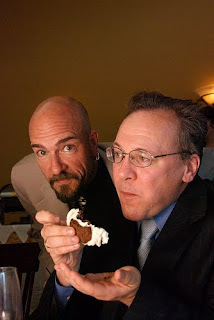 Below the groom eating an ice cream sammy while the officiant/groomsmen and friend leers on.